Oakland, Calif. — Two meetings in Oakland this weekend kicked off the Bay Area Workers World Party presidential election campaign. 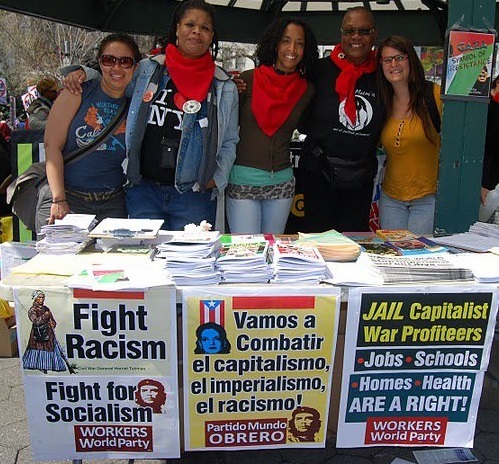 The first meeting was a WW rally held April 16 at the West Oakland Public Library. 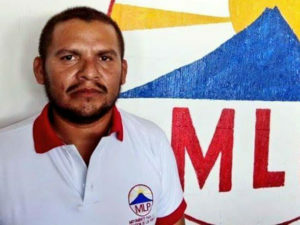 The second was a debate April 17 between the three candidates contending for presidential ballot status on the Peace and Freedom Party ticket. Monica Moorehead, the WWP presidential candidate, and John Parker, WWP California candidate for the U.S. Senate, spoke at both events. Parker, also the Peace & Freedom Party candidate for the U.S. Senate, appearing on the statewide ballot in the upcoming June 7 California primary, opened the Saturday meeting. He gave a historical analysis of the relationship between the profits from the slave system and the wealth of the early capitalists in this country. Parker outlined what he would do first if elected to the U.S. Senate. “I would introduce the ‘Oscar Grant Bill’ to give Black and Brown communities, who are the most victimized by police terror, the ability to remove their police departments and use those resources to enable community-organized self-policing and self-defense,” he stated. Monica Moorehead, Workers World Party candidate for U.S. president, speaking at campaign rally in Oakland on April 16. Monica Moorehead continued the theme of the candidates’ meeting by exposing the racist, terrorist nature of the capitalist system. She spoke about her early involvement in anti-racist struggles and how the fight continues today. 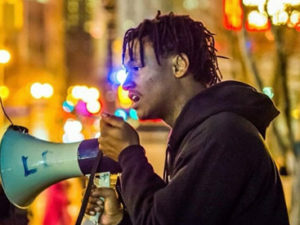 Moorehead also tied in the struggle of immigrants against deportations and Immigration and Customs Enforcement raids with the overall fight against racist terror in the U.S. “These struggles are part of our larger fight to bring down the capitalist system. As revolutionary socialists, we believe that this brutal capitalist system cannot be reformed. 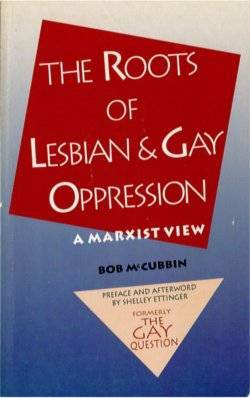 It must be abolished,” Moorehead stated. The following day, Moorehead joined two other presidential candidates, Gloria LaRiva, of the Party for Socialism and Liberation, and Lynn Khan, an independent candidate, at a debate sponsored by the Alameda County Peace and Freedom Party. All three candidates will also be on the June 7 primary ballot. Parker, who is also a leader of the Los Angeles branch of Workers World Party, gave an impassioned talk about the need to abolish the capitalist system. 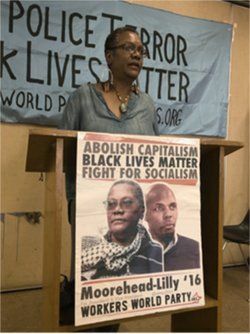 Moorehead presented the key points of the Workers World Party presidential campaign, including the demand for reparations now for Black people still enduring the legacy of slavery. Moorehead also spoke at a Berkeley high school civics class on April 15 and did a radio interview for the progressive Pacifica radio station, KPFK.